What matters most is right now. What matters most is this moment. What matters most is how I live. What matters most is who I am. I chose this photo for a few reasons. It represents time that has passed, is passing, and time still left. 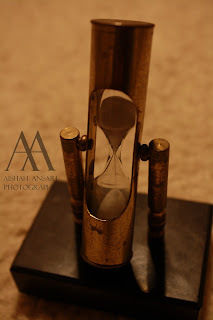 The rustic sand-timer is also symbolic in that it shows it has been through time but still stands. This was one of my very first photography pieces and remains to be be on my favorites. Today is all there is! Beautiful! Because you never know about tomorrow! !